Finch said that he wasn't surprised after India declared with 25 minutes remaining in the day. Aaron Finch bats during day 2 of the 3rd Test between Australia and India at Melbourne Cricket Ground. 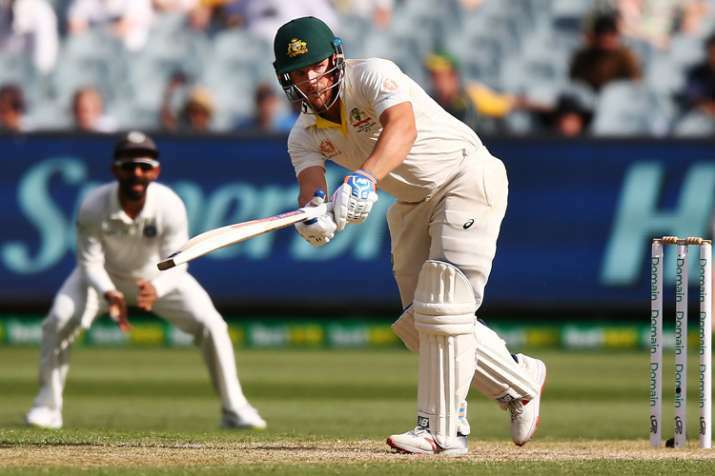 Australian opener Aaron Finch Thursday said the MCG pitch is deteriorating quicker than anticipated and all three results are possible in the third Test despite a slow Indian first innings that finished at 443 for seven. The hosts were eight for no loss at stumps in response. Finch said, "This wicket is probably deteriorating more than we thought it would. Even tonight it was skidding through, there were a couple that took off. So it's still game on if we bowl well and put India under pressure (in the second innings). "I think all three results are still on the table, 100 per cent, India (victory), Australia (victory) and a draw." Talking about the bowling unit as a whole, Finch said, "It was a long stint. I think having Mitch Marsh there was a really crucial part of that bowling attack, the way he controlled the run rate as well. "The way they were grinding away and rolled up their sleeves and did the hard work was outstanding. Obviously, they're tired, no doubt." "After Kohli and Pujara fell, I think their plans changed a bit. They were 300-odd for five wickets down and I think we sniffed an opportunity. Their middle order played well, and it is still well and truly game on. "I wasn't surprised at all especially with us having been in the field for two days. It was the attraction of having us at two-down overnight and it is really positive, and I thought most teams in their position would have done the same thing," he signed off.